The Northern Gateway Pipeline controversy has been remarkable in its intensity, duration, and scope. It has received an enormous amount of mainstream media attention, beginning with Joe Oliver’s January open letter castigating pipeline opponents as foreign-funded radicals, and continuing through the year. From October 2011 through September 2012, the words “northern gateway pipeline” appeared in 191 stories in the Globe and Mail and 433 in the Vancouver Sun. The controversy has infected Canadian national, provincial and interprovincial politics, the most extreme example being BC Premier Christy Clark’s refusal to participate in talks about a national energy strategy because of her disagreements with Alberta’s Premier Redford about sharing the financial benefits of the pipeline. It has penetrated deeply into social media and cultural politics. A remarkable number of young people have added “NoEnbridge” as their middle name on Facebook, and even Rick Mercer had contributed with his comedy skit about Enbridge diversifying into piñatas. There are five categories of reasons why the Northern Gateway Pipeline has been so controversial. The structure of the policy problem has contributed directly to extent of conflict in two ways. First, the distribution of risks and benefits from the project is seriously skewed. The oil sands sector centered in Alberta will receive the overwhelming majority of benefits, whereas the environmental risks of pipeline and tanker accidents are borne predominately by British Columbia. Second, the mega-project is essentially a dichotomous choice. Competing interests can’t bargain over whether to do a little bit of it or a lot. The either/or nature of the choice accentuates the magnitude of consequences and contributes to the sense of immense stakes on both sides. The fact that this inherently divisive problem structure is overlain by Canada’s particular institutional arrangements and history makes it even more divisive. The federal government – now the cabinet – makes the decision on the project, creating the appearance of distant, centralized power imposing a decision against the interests and will of a opposing province. This situation will certainly sound familiar to Albertans, to whom Pierre Trudeau’s 1980 National Energy Program remains a call to partisan and regional arms. The political structure of British Columbia is also quite unstable. The currently BC Liberal majority party has become deeply unpopular and seems virtually destined to be defeated by the leftist New Democratic Party that is strongly opposed the pipeline. NDP leader Adrian Dix filed a very strong criticism of the project with the Joint Review Panel, and he’s announced that if he becomes premier the province will reassert its jurisdiction over the environmental assessment of the proposed pipeline. In terms of interprovincial political structures, there are deep value differences between British Columbian and Albertans. These differences are revealed not just in voting behaviour, but also in responses to questions about value tradeoffs between energy and economic development on the one hand and environmental protection on the other. The center of political gravity in British Columbia is further left and much greener than in Alberta. In addition to this unstable and divisive national, provincial, and interprovincial political structure, the pipeline proposal has also met with exceptionally formidable organized opposition by environmentalists and First Nations. Environmentalists have brilliantly seized on the issue as a way to mobilize sympathetic British Columbians, especially on the issue of tanker risks, and turned a relatively unaware and indifferent public into strong opponents. The latest poll shows opposition has increased to 60%. 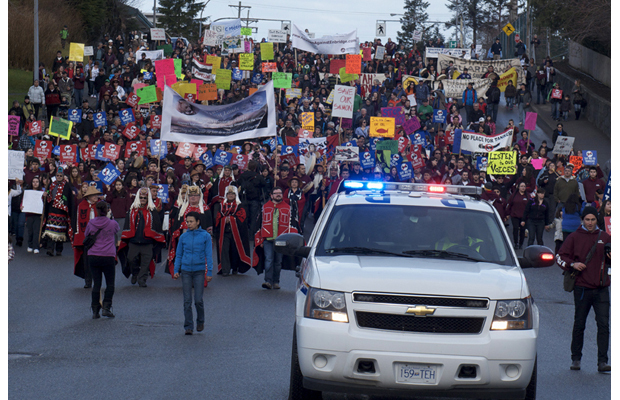 First Nations in BC have also been strongly opposed, and their legal position gives them considerable power. The fact that much of the pipeline’s proposed path (and the tanker routes until open water in the Pacific Ocean) in BC goes through the traditional territories of First Nations greatly complicates the rules for consultation and accommodation. If the structure of the problem and politics were not enough to create an intense controversy, a series of unfortunate events for pipelines and oil companies added fuel to the fire. The 2010 BP Deepwater Horizon blowout in the Gulf of Mexico was a major political setback for oil megaprojects. The risk of pipeline accidents was accentuated when a significant spill occurred in Northern Alberta in April 2011. The Keystone Kops reference produced a fundamental shift in elite opinion and political positioning — suddenly support for Enbridge was politically toxic. Op-ed writers and columnists declared the pipeline dead. BC’s leading political columnist claimed the “pipeline looks dead and buried,” and another leading columnist announced that the NTSB report “sounds death knell for pipeline.” BC Premier Christy Clark shifted from her “wait and see” position to forcefully advocating five preconditions to the provinces support, including “a fair share of the fiscal and economic benefits of a proposed heavy oil project that reflects the level, degree and nature of the risk borne by the province, the environment and taxpayers.” Federal Conservative politicians, including Prime Minster Harper and Natural Resources Minister Joe Oliver, seem to have muted their advocacy of the project. While probably less important than the previous three categories of reasons, pipeline proponents have not played their hand as effectively as they might have. Enbridge’s efforts to consult northern communities, especially First Nations, have been roundly criticized as inadequate. But the highest profile blunder was by Natural Resources Minister Joe Oliver. On the eve of the opening of the Northern Gateway Pipeline hearings, Oliver issued his now infamous open letter to Canadians, demonizing environmental opponents to the project as “radical groups” receiving “funding from foreign special interest groups” who “threaten to hijack our regulatory system to achieve their radical ideological agenda.” While Harper must have believed the move would be politically beneficial, it seems to have backfired significantly by pushing many moderates who were offended by the style of attacks into strong opponents of the pipeline. While it’s far more speculative, I also believe there is something larger at stake here: a deep divide over what kind of country Canada is. (I’ve hyperbolically titled talks about these ideas “how did an oil pipeline become a battle for the soul of our nation?”) Harper has communicated a strong vision that Canada’s future wealth is tied to commodity development and export, especially oil sands. While the governments of Alberta and Saskatchewan and much of their public seem enthusiastic about that vision, many in the rest of Canada are strongly alienated from it. You can see this is the concerns (even if ill-advised) about “Dutch disease” in Ontario, and in the strongly environmentally oriented provinces of Quebec and British Columbia. The counter vision to Harper’s “Carbon Canada” has yet to be articulated, but it feels nascent in much of the criticism and antipathy to the Harper government’s “responsible resource development” agenda. Will 2013 be any different? The remarkable controversy over the Northern Gateway pipeline has been fueled by a continental divide in interests and values, by events that have damaged the reputation of Enbridge, by strategic blunders of pipeline proponents, and by a deep divide in what kind of future we want for Canada. What’s likely to happen in 2013 and will it dampen the intensity of the controversy? I expect that the pipeline will remain as controversial and perhaps become even more so in the upcoming year. The problem structure won’t change, unless the federal government or Enbridge finds a way to deliver much greater financial benefit to British Columbia. The political structure at the federal level won’t change absent an unexpected political crisis. BC is likely to have a new government, which should significantly increase tensions between BC and Alberta, and between BC and the Harper government. Environmental opposition isn’t going anywhere. First Nations opposition west of Prince George has shown no signs of cracking, and the #idlenomore movement is providing a new voice to long simmering indigenous grievances about living conditions as well as land and resource rights. Perhaps there won’t be any new big pipeline accidents, and maybe pipeline proponents will have learned from past mistakes and become more political deft. The issue could quickly recede if Enbridge withdraws its proposal, but it has shown no inclination to do so, just the opposite in fact. Joint Review Panel hearings will wrap up in the next several months, and that may dissipate media interest in the story. But the panel is required to report by the end of the year and that is bound to reignite the controversy. Canada has a resource-dependent political economy but a political culture that has not been comfortable abandoning its aspirations for leadership in environmental sustainability. We are a developed democracy but have unusual party and federal systems that foster both partisan and intergovernmental conflict. We take pride in our international reputation for supporting human rights but have not appropriately reconciled with the original inhabitants of the land. It’s no surprise that a pipeline megaproject – taking carbon-intensive oil, across unceded aboriginal territory of spectacular wilderness and waterways, to markets in China — is proving to be a divisive, nation-defining controversy. This entry was posted in Energy Pipelines, Oil Sands. Bookmark the permalink.